Can adding springs—polycarbonate or rubber—to the soles of running shoes help you run faster? We tested three new shoes from Adidas, Reebok and new Swiss brand On Running to find out. Surprisingly, the answer was a pretty definitive yes. What's A Spring Loaded Running Shoe? It's a weird category that takes a little explanation. The first thing you have to get your head around is that these aren't and can't be the fastest running shoes out there. Those will always be track spikes, as worn by athletes like Usain Bolt. They're also not ultralight running shoes of the kind worn by marathon winners, although the Ons are beginning to make waves in the professional Triathalon world. Instead, all three of the shoes you see here are targeted at casual runners—people who run for exercise and recreation and maybe compete in the occasional race. You totally could run a marathon in them; they're just not going to be as light and minimalist as the shoes currently worn by champion professional athletes in that sport. So what's the idea with the springs? Well, all three shoes here claim a performance advantage from them. It's worth noting that none of these makes the outright claim of "faster" (likely due to the qualifiers mentioned above), instead hedging with statements like "…harness and release more energy to help propel you forward," (Adidas); "…rip through mud, snow, sand and grass…" (Reebok); and "…transforming running energy into forward momentum," (On). Bret Bassi is an LA-based music manager who moonlights as a fitness trainer, boxing instructor and competitive athlete. The Test: As you can see in the above video, we ran timed 50 meter sprints in all the shoes, including a "control" pair, which were Bret's standard running shoes and roughly equivalent to the class occupied by the spring-loaded competitors—a nice shoe for casual runners and occasional racers. Honestly, the test should have been stacked in the Marathon's favor; not only is Bret much more used to the Adidas Marathons (running in them every day), but at 9oz, they're a full ounce lighter than the next lightest shoe here, the On Cloudsurfer, and perceptibly lighter than the 13.5oz Springblades. Don't judge Bret's split times too harshly. I paced off what I thought was roughly 50 meters, but that measurement likely isn't totally accurate. Use it for comparison only. While the gap isn't enormous, two tenths of a second over 50 meters is an appreciable performance advantage and one we were not expecting to see. Since that sprint test, both Bret and I have worn the shoes day-to-day, both while running and just during every day tasks like walking the dogs or going to the gym. Total mileage in each shoe is probably around 15-20 miles. That running was conducted both on surface streets and through Los Angeles' popular Runyon Canyon Park. The latter is a serious test of any shoe's traction; the trails in Runyon are steep and composed of loose, sandy dirt over sharp rocks. The Best Spring-Loaded Running Shoe You Can Buy Is: The $140 On Cloudsurfer tied for the fastest time in our test with the Reeboks and also proved equivalently comfortable to wear. The Cloudsurfer's ventilation far exceeds that of the ATV 19 and the sole provides equivalent stability. That's actually very impressive; with the large gap between the rearmost springs and the back of the heel, I was worried they might have a tendency to roll backwards. But, even during weightlifting exercises where much force is being channeled through the heel—overhead barbell presses and squats—the Cloudsurfer proved reassuringly supportive and stable. 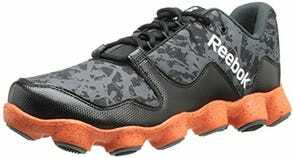 The victory would have to the $79.99 Reebok ATV 19 Ultimates, were they not so… well, horrendously, eye-shatteringly, offensively hideous. Not only are they much cheaper than both other shoes, but at 11.5oz, they're 2oz lighter than the Adidas while providing staggeringly better traction on loose trails. That latter feature really stood out on the ATVs, they deserve their name, these trail runners provide as much traction as a quality hiking boot in a trail shoe that runs as fast as a street running shoe. While you can feel the pressure of each individual spring pod through the foam sole, that actually ends up proving a benefit while running or hiking on dirt as each of the pods provides its own tactile feedback about the grip levels and surface conditions it's hitting. None of the feared hotspots manifested themselves. It should be noted that the ATVs run a half size large where the other two pairs fit true-to-size. 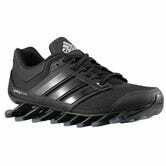 Then there's the Adidas Springblade Drives. At $180, these are both the most expensive and heaviest shoes in this test, but also the most visibly unique in terms of the distinct spring blades that give them their name. They match the On Cloudsurfer on ventilation and, as the other two, are surprisingly stable. Really, where they fall down is grip. Each blade is tipped with a small, very hard piece of rubber that just doesn't provide the traction you're looking for on any imperfect surface. They're fine on a sidewalk, but even dry grass sees them slipping. Having said that, they do provide the most distinct "spring" feeling. We came into this test skeptical of the entire concept of a spring-loaded shoe, but had our minds completely changed by products that didn't feel alien at all, while all providing a noticeably significant energy return while pushing off. None of the three pairs tested feels even remotely like wearing a moon shoe or other novelty product. They just feel like really nice running shoes with, well, an extra spring in their stride. Perhaps the greatest tested advantage across all three pairs was in marginally reduced fatigue over distance when compared to the unsprung control shoes. This is impossible to quantify, but the little bit of extra forward momentum the sprung shoes provide seems to leave you with a little more energy at the end of your run. The Rest: Notably absent from this test are any of the Nike Shox range. First launched in 2000 and only incorporating springs in their heels, the Shox are primarily about reducing heel strike forces and not providing performance advantages, so we left them out. 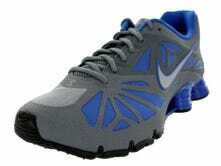 On also offers a comprehensive range of spring-soled running shoes. Each is recommended to customers based on their pace. 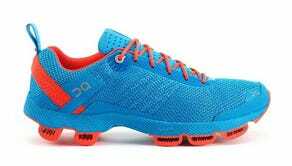 The Cloudsurfers are the second-fastest shoe in the range, recommended for runners averaging 6.4 to 8-minute miles. That's about our speed and these are the model that most closely corresponds to the other shoes tested here. The $130 Cloudracer is their competition shoe, coming in at a lighter, but less durable 8oz. The $120 Cloudster provides the energy return benefit of the springs in a more durable, more broadly applicable trainer that will be better for general purpose athletic wear. Photos and Video: Chris Brinlee Jr.